Most people need a shot of espresso, a cup of foam-rich café latte or a frothy matcha green tea before heading to work. Coffee and tea lovers are obsessed with figuring out the right amount of coffee beans or tea leaves to add to water or milk, which brands provide the best taste and how much foam (or none at all) enriches their daily cuppa. Baristas are famous for whipping up a wonderfully delectable foam on all coffee drinks. Café lattes and cappuccinos are incomplete without a layer of fluffy clouds sitting on top of the actual drink. The good news is that you can achieve that perfect froth right at home with a milk frother machine. You will be amazed at the assortment of milk frothers available in the market today. To make the decision easier, we have put together a list of the 7 best ones along with a quick comparison chart and a comprehensive explanation of each frothers’ features. You can have a look at a quick overview of each milk frother below or scroll down to read a full-scale analysis on each. Which Milk Frother to go for? VAVA Electric Liquid Heater and Milk Frother is the perfect choice for cappuccino lovers who want hot coffee with a hot froth on top. It has a sleek design and comes with an extra pair of whisks for free. Perhaps the most unique aspect of this milk frother is that it’s silent. When the froth is being created or the milk is warming up, you can’t hear any noise. So it’s perfect for coffee lovers who enjoy some quiet time while sipping a cappuccino or flat white in the morning before heading to work. 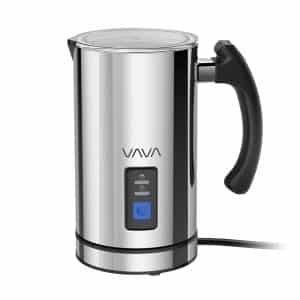 Besides being an efficient heater and a silent device, the VAVA heater and frother boasts an angled ergonomic spout ensuring that spills are kept to a minimum. It also has markings for the amount of milk needed to simply heat the milk or heat it and create a rich, foamy froth. It’s easy to make a Barista-level macchiato for a cool rainy day, a steaming hot chocolate during winter to fight the nail-biting winds or a green tea matcha on weekends. Moreover, cleaning it is a hassle-free job since it has a non-stick Teflon coating. This small and powerful device packs a punch. For starters, it creates the perfect foam in just 10 seconds. It comes with a stand which makes it easy to store, two milk frothing whisks, one egg beater and one cocktail mixer along with two pre-installed AA batteries. The potent motor spins at an impressive 15,000 revolutions per minute. Besides making delicious bubbles and foam atop café lattes, milkshakes, cold coffees and matcha green tea, this frother can also whisk eggs, smoothen sauces and whip soups. The Le’Xpress Forther by KitchenCraft is a highly cost-effective device for coffee and milkshake lovers on a budget. Its lightweight, has a soft touch handle and a stainless steel coil which generates airy bubbles in a few seconds. The frothing attachment is removable which makes it easy to clean the device. Besides frothing milk, the Le’Xpress Forther can whisk eggs, meringues, custards, soups, salad dressings and other liquids or semi-solids. The 12-month warranty provided by KitchenCraft ensures that it works all year round. The Aerolatte Milk Forther is a handheld, battery-powered milk frother machine that produces creamy clouds of airy milk in less than 20 seconds. 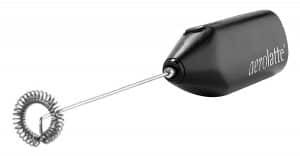 This is the only frother on this list that can be used to whisk a variety of milk including cow’s milk, soy milk, almond milk, rice milk, coconut milk, skimmed milk, powdered milk and ultra-high temperature processed milk. The fact that it can easily whip up almond and soy milk makes it an ideal choice for vegans. 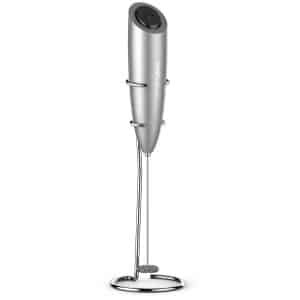 Its stainless steel body and tight coils ensure that the frother lasts for a long time. Moreover, the Aerolatte Milk Frother comes with a storage tube which makes it easy to put away in the kitchen. Looking for a Starbucks-like froth in your everyday Frappuccino? Want to impress friends and family members with your superb coffee making skills? 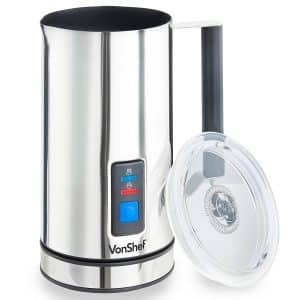 The VonShef milk frother is the perfect choice for you. 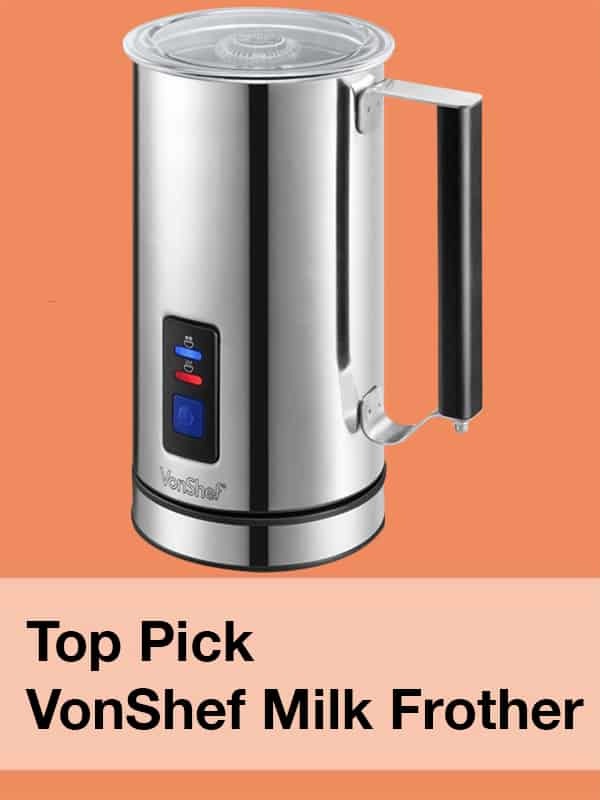 Its sleek stainless steel design heats and froths milk. The cordless frother comes with a two-year manufacturer’s warranty, a 360-degree swivel base, automatic switch off button and a heat-resistant handle! Additionally, the VonShef frother comes in attractive red, copper and silver colors. Once the milk is heated, the frother starts to create an excellent foam. There’s no need to standby and wait for the froth to be ready since indicator the light signals when it’s ready for consumption. Also, cleaning is a breeze because it boasts of a non-stick coating. This frother will instantly transform you to a street side café with its smooth lather atop a piping hot cappuccino. Made from heat resistant borosilicate glass, this little handy appliance has a silk plastic lid that prevents the foam from spilling onto the table. It’s also a great frother if you want to closely watch the milk swirl into a creamy texture. The Bodum Latteo Milk Frother is the only one on this list that manually creates froth. In about 30 seconds of pushing the plunger up and down, preheated milk is instantly transformed into tiny airy bubbles. Moreover, it’s dishwasher-friendly. Also, there are markings for how much milk is required to produce a nice froth for your iced coffee. Last but certainly not the least is the SimpleTaste Electric Milk Frother. The battery-powered handheld device has a stylish body and a nifty stainless steel stand. By simply pressing the on button for a few seconds, a smooth texture of airy bubbles is created atop a cold chocolate milkshake. It’s easy to become a latte art expert with this milk frother. It comes with two AA batteries, a delicate stand and an instruction manual. The Simple Taste Milk Frother doesn’t just beat milk up. It can also whip eggs, blend sauces, smoothen salad dressings, mix custards and delectable meringues. Additionally, it creates a nice big froth so you don’t have to worry about it fading away quickly. You will have a slew of Instagrammable lattes at your fingertips with this milk frother machine. 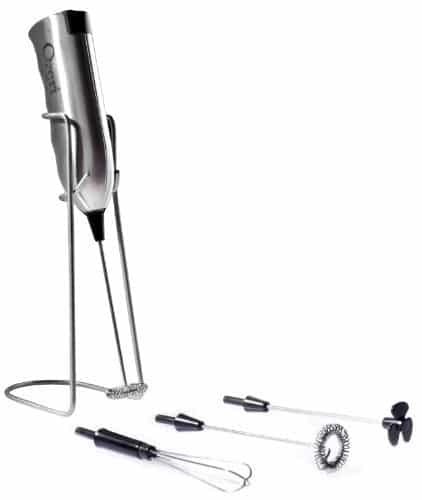 Best quality and features – The Ozeri Deluxe Milk Frother has the best features and quality overall because it froths different types of milk and comes with an egg beater, cocktail mixer and two frothing whisks. The stand makes storage easy and two AA powered batteries that are delivered with it means that you won’t have to worry about anything else. It’s a complete package on its own. If you want a frother for more than just frothing cappuccinos, this is it. 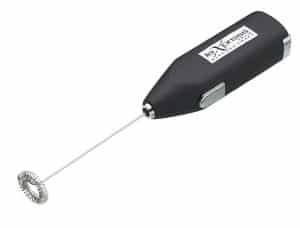 On a budget – Priced at just a few pounds, the Le’Xpress Frother offers value for money. It can also beat up eggs, produce silky meringues and seamlessly textured salad dressings. However, the batteries might need to be changed frequently since it has a powerful motor that whirrs the whisker at an impressive speed. Perfect Barista-level froth – The VonShef Milk Frother instantly transports you to a Starbucks. If you’re looking for the perfect froth and feel it’s an essential part of your cappuccino, then this device should be your first pick. Indicator lights signal when the impeccable foam is ready for consumption. Impress your friends when they come over for a cuppa. Creating a heart-shaped design on your froth is a breeze with VonShef. For vegans – The Aerolatte Milk Frother doesn’t just whip up ordinary cow milk. It also aerates almond, rice, coconut, soy, powdered and skimmed milk. If you’re a vegan, this is a good option especially if you are trying different kinds of plant and vegetable derived milk. This frother lets you enjoy a warm hot chocolate made from soy milk with a cool froth on top on a wintry night. For more hands-on coffee making – If you like to get down and dirty with your coffee or love a French press over a battery or electric-powered instant coffee then the Bodum Latteo Milk Frother is a good choice. You can control the amount of froth you want on your macchiato or iced coffee easily. Also, since it’s made of heat-resistant glass, you can watch the milk swirl. It’s a recommended buy for coffee lovers interested in the process of making the perfect brew. 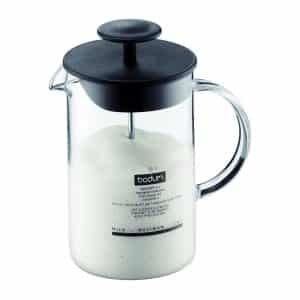 Usually, with the exception of a few models such as the Bodum Latteo Milk Frother, most frothers are powered by either batteries or electric plugs. While the power plug operated ones warm the milk and make an excellent froth, the battery powered ones are portable. It really depends on whether you would like to use the frother solely at home or in the office and at home. Of course, if you wish to use it in your office and at home, it makes sense to opt for a battery powered one since it’s easy to carry and transport. However, portable frothers need their batteries to be replaced frequently since the stored energy depletes quickly with repeated use. Would you like to use your frother to just whisk milk for your coffee or would you also like it to beat eggs, smoothen sauces and give silky meringues? Some coffee lovers are content with using it just to foam milk but others may want to use it to beat their eggs for mouth-watering scrambled eggs to accompany their latte for breakfast. Obviously, if you already have a whisk or beater at home, buying a multi-purpose frother might not be on your consideration list. Whatever you choose, ensure that you get ample value from your purchase. Almost always, the battery-powered frothers don’t heat milk. Caffeine addicts might want the milk and froth to be heated at the same time. If you don’t want to preheat your milk and then froth it or don’t want the trouble of popping a cold froth in a microwave to warm it up, it would be advisable to go for an electrically powered milk frother. Usually, in baristas, the froth is made while heating the milk. You might also want to look into the available storage space in your kitchen, the design of your ideal milk frother and whether you need one that can foam multiple cups of cappuccino. Undoubtedly, your budget plays an important role in your decision of selecting the milk frothing machine. Also, look for a manufacturer’s warranty or a money-back guarantee. Various companies are generally willing to exchange frothers that are damaged or malfunctioned. No matter what frother you decide to buy, make sure that it is exactly what you’re looking for. Every caffeine connoisseur has their own idea of a perfect cup of hot coffee. Buying a frother will enhance your mornings and give you Barista-like coffee whenever and wherever you’d like. Or go the hold hog and go for a bean to cup coffee machine! This review was written by Rudy Caretti who has more than 15 years of experience in the coffee industry, a passion that started in Italy within the family business and brought him to found Gimoka Coffee UK and G Coffee Pod with a group of friends, who share the same passion.